Bonnieview Farm is a sheep and cow dairy located in the Northeast Kingdom of Vermont, and has been in the Urie family for four generations. The farm is a mixture of rolling pasture, hay fields, and woods, where Neil, Kristin, Tressa Urie and the triplets live and farm. Neil's great-grandfather first bought the farm in 1890, and it was primarily a cow dairy for many decades, with pigs, sheep, and horses as well. Neil's grandfather and father were both born at the farm. Neil bought Bonnieview Farm in 1995 from his uncle, a traditional cow dairy farmer, because he did not want to see the farm leave the family. The Urie’s milk 180 ewes that they rotationally graze from May to October, and make three kinds of cheese with the milk. In August 2013, they started milking 15 cows. They raise lambs for meat, make various products with their wool, and sell individual fleeces to spinners. In addition to the sheep, they have a breeding pair of pigs, a flock of laying hens, two cows, a llama, a dog and a cat. As Neil has expanded his farm to include more cows, he has gradually developed three types; cheese made from 100% raw sheep milk, cheese from 100% raw cow milk and now he has launched a mixed milk category. 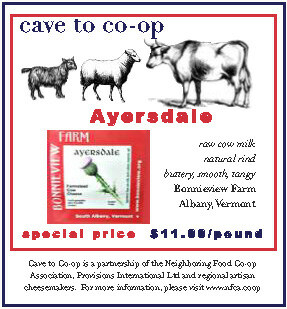 Ayersdale is a 100% raw cow milk cousin of Bonnieview’s sheep milk Coomersdale. Made with the milk from their 15 grass-fed cows, Ayersdale is buttery and smooth, with slightly more tang than Coomersdale. Delicious on its own, Ayersdale works beautifully in the kitchen, as you will see! Put oven rack in middle position and preheat oven to 350°F. Butter ramekins or baking dish. Separate eggs, putting whites in a large bowl and carefully sliding whole, unbroken yolks into a small bowl of cold water. Beat whites with salt, pepper, nutmeg, and cream of tartar using an electric mixer at medium-high speed until they just hold stiff peaks. Fold in ½ cup cheese gently but thoroughly, then divide mixture among ramekins or transfer to baking dish, smoothing top slightly (whites will stand above rims of ramekins). Make an indentation in center of whites in each ramekin or make 6 evenly spaced indentations if using baking dish. Carefully remove yolks from water 1 at a time with your fingers and put 1 yolk in each indentation. Stir créme fraîche and spoon 1 tablespoon on top of each yolk, then sprinkle eggs with remaining cheese. Transfer ramekins (if using) to a large shallow baking pan. Bake until whites are puffed and pale golden (yolks will jiggle slightly), 10 to 14 minutes. Sprinkle with chives and serve. Measure the leeks, onion, and garlic to be sure you have about 1 quart. In a 7- or 8- quart pot, heat the olive oil over medium heat. Slowly stew the leeks, onion, and garlic for 10 minutes. Add 1 teaspoon salt and cook for 5 more minutes. Meanwhile, preheat the oven to 250°F. Cut the bread into 1-inch cubes. You should have about 2 quarts. Spread the cubes in one layer on an oiled baking sheet and bake for 45 minutes, or until just golden. Let cool and store until ready to use. Add the greens to the leeks in the pot, cover, and cook over low heat for 45 minutes. Uncover and boil away excess liquid. Allow to cool. Add the lemon juice, pepper, and nutmeg to taste. About 2 ½ hours before serving, oil a deep 3-quart casserole, preferably earthenware. Place one-third of the bread cubes in the dish, top with half the greens, and repeat, ending with the bread cubes and patting lightly to make an even topping. Gradually pour the hot milk down the insides and over the top of the panade so everything is moist. If necessary, add ½ cup water. Cover with the grated cheese and a sheet of foil. Bake in a preheated 250°F oven for 1 ¾ hours. Raise the oven temperature to 400°F, uncover, and bake 20 more minutes. Remove from the oven and allow to relax for about 10 minutes before serving. uncovered until any liquid evaporates, about 2 minutes. Season with salt and pepper. Transfer to bowl; cool. Stir in cheese and tarragon. Place thawed puff pastry sheet on work surface. Cut pastry sheet into 4 rectangles. Place cheese mixture on half of each pastry shape, dividing equally. Brush pastry edges with egg glaze. Fold pastry over filling, pressing to adhere. Press edges with fork to seal. Brush turnovers with egg glaze. Pierce pastry in several places with toothpick. Place on baking sheet. Chill 20 minutes. Preheat oven to 400°F. Bake turnovers until puffed and golden, about 18 minutes. Serve warm. Place a 6-cup popover pan in the bottom third of an oven. Preheat the oven to 400ºF. In a small saucepan over medium-high heat, warm the milk until small bubbles form around the edges. Put the flour and salt in a fine-mesh sieve and sift onto a sheet of waxed paper. In a large bowl, whisk the eggs until frothy, about 2 minutes. Slowly whisk in the hot milk, whisking constantly so the eggs don’t cook, then gradually whisk in the flour mixture until almost smooth. Remove the popover pan from the oven and spray the cups with nonstick vegetable spray. Fill the prepared cups about three-fourths full with batter and sprinkle each with ½ oz. cheese. Return the pan to the oven and bake for 15 minutes, then rotate the pan 180 degrees. Continue baking until the popovers are browned and puffed, 30 minutes more. Invert the pan and remove the popovers. Serve immediately. Using a paper towel, wipe out the excess fat from the popover cups. Heat the pan in the oven for 5 to 10 minutes. Repeat baking instructions with remaining batter.